The American College of Obstetrics and Gynecology (ACOG) is one of the leading professional organizations of physicians who work in the area of obstetric medicine. Obstetricians practicing in the United States are influenced by ACOG statements and practice bulletins, and it's important that parents familiarize themselves with the recent position changes that are relevant to birth, choice, and justice. If you are writing up a birth plan or birth preferences and discussing them with your provider, and you find that there's push back to any of your preferences that are supported below, PRINT OUT the committee opinion and bring it to your doctor or midwife. If they still don't support it, find a new care provider. ACOG acknowledges that "many common obstetric practices are of limited or uncertain benefit for low-risk women in spontaneous labor," including routine amniotomy (when the doctor or midwife breaks the bag of waters around the baby), continuous fetal monitoring, IV fluids, laboring in one position, initiating pushing upon full dilation without the urge to push, and others. They acknowledge the benefits to staying at home in early labor, massage, hydrotherapy (aka labor tub or shower), doulas ("continuous one-to-one emotional support"), frequent position changes and movement, and mother-directed pushing ("open-glottis pushing"). Furthermore, care for low risk pregnant people should should be collaborative and individualized. ACOG has found that delayed cord clamping (of at least 30-60 seconds) benefits both preterm and term infants. Not surprising, given that almost a third of the baby's blood IS IN THE PLACENTA at birth! For preterm babies, it improves transitional circulation, establishes better red blood cell volume, and decreases the need for blood transfusion, lowers the risk of brain hemorrhage and other problems. For term babies, it increases hemoglobin levels and gives better iron stores, preventing iron deficiency anemia, which is a serious global public health issue with lifelong ramifications. This statement is a big deal for those of us who feel passionate about delayed clamping, and a long time coming! ACOG agrees with studies that have found a reduction in the use of anesthesia for people laboring in warm water. 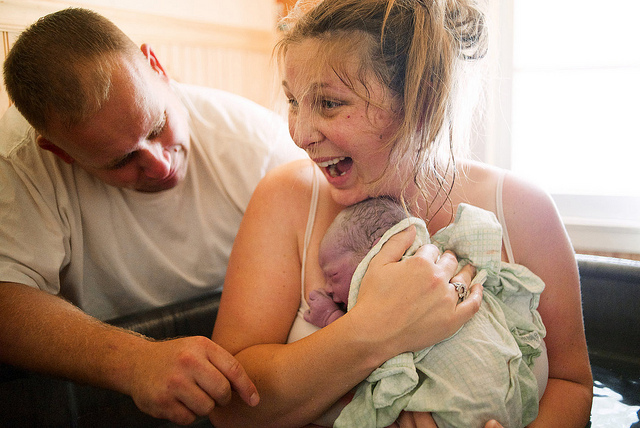 They still recommend birthing on land, because the "benefits and risks of this choice have not been studied sufficiently to either support or discourage" water birth. ACOG agrees that "each woman has the right to make a medically informed decision about delivery," including where she will give birth. Though they still maintain that the hospital and accredited birth centers remain safer than planned home birth, this statement is an important departure from their earlier position on home birth. It is absolutely unethical to coerce someone into something against their will. ACOG states that "[f]orced compliance—the alternative to respecting a patient’s refusal of treatment—raises profoundly important issues about patient rights, respect for autonomy, violations of bodily integrity, power differentials, and gender equality." Physicians must respect a patient's decision, even when they disagree with that decision, and they must pay attention to the individual context from which that women/person comes. They state that it is unacceptable to use the court system to force a parent or parents into making a decision against their will. ACOG acknowledges that racism and ethnic discrimination exist within the medical system broadly and in obstetric and gynecologic care specifically, and that it is perpetuated by individual practitioners and on the systemic level, and manifests in a variety of ways (for example, downplaying symptoms when African-American women report that there's something wrong with how their body feels). They recognize the need for diverse practitioners, research that acknowledged disparities, diversity training and recognition, and the need for approaching each person as an individual. The responsibility for addressing racism rests on all of us--doctors, midwives, nurses, doulas, lactation consultants, childbirth educators--and each of us has a part to play in dismantling systemic oppression.